Navigator of the Seas at its new year-round home in PortMiami. Photo credit: Royal Caribbean. Until May, Navigator of the Seas will set out on five- to nine-day Caribbean cruises. 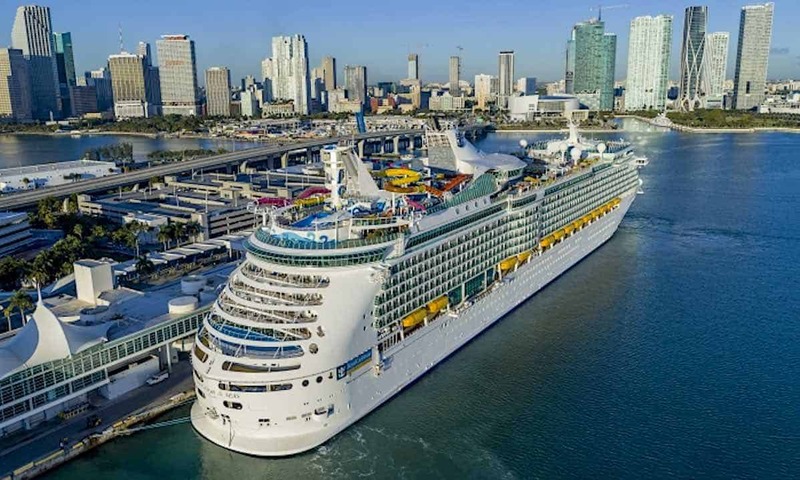 Then beginning in May, itineraries change and will offer three-day weekend cruises and four-day mid-week cruises to the Bahamas. Every cruise will include a day at Royal Caribbean’s private Bahamian island, CocoCay. Riptide – The cruise industry’s only headfirst mat racer waterslide. The ride ends as you slide through a translucent tube with a view of the ocean. To Dry For – First-ever blow-dry bar at sea. This should be a really popular venue especially after a day at the beach. Stop in for blowouts, hairstyling and other services. Thirsty? There’s wine and champagne for purchase. The Lime and Coconut – Three-level signature tropical-themed bar including a “rooftop” deck for a spectacular view and live music. Navigator of the Seas and Royal Caribbean’s first head-first waterslide. Following this massive refurbishment, you’ll now find several of Royal Caribbean‘s stand-out eateries aboard Navigator of the Seas. Stop in at Hooked Seafood for a New England-style menu that includes lobster rolls. There’s a Jamie’s Italian, celebrity chef Jamie Oliver’s rustic Italian restaurant. For quick bites, visit the first Johnny Rockets Express, over at the Poolscape. For Mexican fare, El Loco Fresh serves fish tacos, beef burritos and more. Navigator of the Seas is the third ship in the Royal Amplified upgrade program. The cruise line is investing over $1 billion in modernizing much of the fleet. The refurbishment covers 10 ships in four years. So far, Mariner of the Seas and Independence of the Seas have been upgraded. Also read: How much will you pay for gratuities on Royal Caribbean?